PYONGYANG, North Korea (AP) — The two Korean leaders took to the road for the final day of their summit Thursday, heading to a beautiful volcano considered sacred in the North and used in its propaganda to legitimize the Kims’ three generations of rule. Their trip followed a day of wide-ranging agreements they trumpeted as a major step toward peace on the Korean Peninsula. However, their premier accord on the issue most fascinating and worrisome — the North’s pursuit of nuclear-tipped missiles that can accurately strike the U.S. mainland — contained a big condition: Kim Jong Un stated he would permanently dismantle North Korea’s main nuclear complex only if the United States takes unspecified corresponding measures. Kim and South Korean President Moon Jae-in flew separately to an airport near Mount Paektu on Thursday morning where they met up and drove to the mountain on the North Korean-Chinese border. Members of the Kim family are referred to as sharing the “Paektu Bloodline.” The volcano topped with a deep crater lake is also emblazoned on the national emblem and lends its name to everything from rockets to power stations. Moon plans to return to South Korea later Thursday, but the leaders are still basking in the glow of the joint statement they settled Wednesday. Compared to the vague language of their two earlier summits, Kim and Moon seem to have agreed on an ambitious program meant to tackle soaring tensions last year that had many fearing war as the North tested a string of increasingly powerful weapons. Kim promised to accept international inspectors to monitor the closing of a key missile test site and launch pad and to visit Seoul soon, and both leaders vowed to work together to try to host the Summer Olympics in 2032. The question is whether it will be enough for President Donald Trump to pick up where Moon has left off. Trump told reporters Wednesday that the outcome of the summit was “very good news” and that “we’re making tremendous progress” with North Korea. He didn’t indicate in his brief remarks whether the U.S. would be willing to take further steps to encourage North Korean action on denuclearization. Declaring they had made a major step toward peace, Moon and Kim stood side by side Wednesday as they announced their agreement. Historians say the 5,000-year timeline of Korean history is a groundless claim that became part of South Korea’s official narrative after being inserted in school textbooks during the rule of former dictator Chun Doo-hwan. This week’s summit comes as Moon is under increasing pressure from Washington to find a path forward in efforts to get Kim to completely — and unilaterally — abandon his nuclear arsenal. Trump has maintained that he and Kim have a solid relationship, and both leaders have expressed interest in a follow-up summit to their meeting in June in Singapore. North Korea has been demanding a declaration formally ending the Korean War, which was stopped in 1953 by a cease-fire, but neither leader mentioned it Wednesday as they read the joint statement. In the meantime, however, Moon and Kim made concrete moves of their own to reduce tensions on their border. Though not directly linked to security, the leaders’ announcement that they would seek a joint Summer Olympics was a significant move in terms of easing tensions and building trust. It also flows from the North’s decision to participate in the Pyeongchang Winter Games in February, which was regarded as a success for both sides. 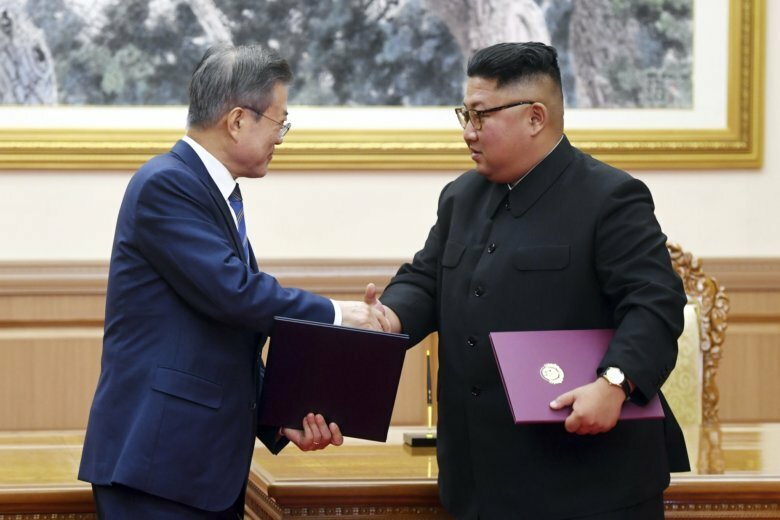 Other agreements aimed at removing some longstanding irritants from their relations, such as allowing more contact between families divided by the Korean War. Moon also appeared to be making good on his proposals to help build up the North’s infrastructure and open cross-border rail links. Unlike Trump’s initial tweets praising the summit, the news brought a quick and negative response from Republican Sen. Lindsey Graham, who tweeted that he was concerned the visit would undermine efforts by Secretary of State Mike Pompeo and U.N. Ambassador Nikki Haley to impose “maximum pressure” on the North. “While North Korea has stopped testing missiles and nuclear devices, they have NOT moved toward denuclearization,” he tweeted.